Pale gold straw color hints at the wine’s youth. Obvious aromatic drive, intensity and power. Concentrated lemon oil and lime zest, flint, clove and oatmeal, Asian pear and jasmine. At once both ripe and savory on the palate. Yellow peach, white melon, lemongrass and deep citrus oil. Sea spray, sweet sage and spearmint edges. Long echoing persistent flavor. Weight builds and volume increases dramatically as the wine grows in the glass: green tea, seashell, apricot and ginger. 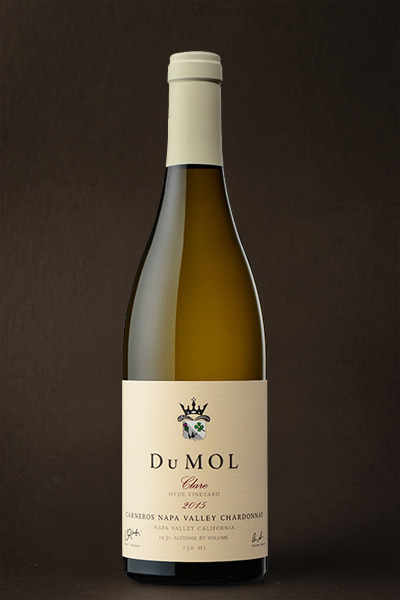 Deep oily viscosity and bright acidity duel out the lengthy finish in this world-class Chardonnay. In our complete 2015 line-up, there is no finer bottling than our Hyde Vineyard Clare; it's that good. No vineyard benefited more from the vintage’s low yields than this iconic world-renowned site. Berry size was tiny with a preponderance of small, seedless “shot Wente” berries. It’s these rare grapes that add that extra dimension of concentration — lime-like intensity, river-pebble saline vibrancy, deep underlying density. These are the grapes that really make the wine. There’s a classic shimmering crystalline character to the bottling, and absolutely no interference from winemaking elements or technique; it’s pure unadulterated Hyde Vineyard in all its many glories. No exaggeration, no hype — this goes down as one of our greatest ever wines. Expected to age like a red wine, it will open up considerably after 2019. We are incredibly proud of this beautiful Chardonnay.